Alaskans are invited to contribute a brief essay (150 words or less) to “150 Reasons We Love Alaska,” a publication to be distributed in early 2017 during Alaska’s sesquicentennial year. Submissions can be sent to gov.alaska150@alaska.gov. The painting will be on display at the Museum of the North, University of Alaska Fairbanks. Decolonizing Alaska is a multimedia visual art exhibit featuring contemporary artists exploring and responding to Alaska’s history of colonization and its emerging influence on sustainability, both environmental and cultural. As part of the exhibition Decolonizing Alaska, this discussion will bring together artists Annette Bellamy, Joel Isaak, Da-ka-xeen Mehner, Rika Mouw, Michael Walsh, and Crystal Rose Worl for a conversation moderated by curator Asia Freeman. The University of Alaska Museum of the North is offering a lecture about a painting of historic importance to Alaska. “Signing of the Alaska Treaty” by Emanuel Leutze is touring the state to commemorate the 150th anniversary of the 1867 treaty to purchase Alaska. Alaska historian Terrence Cole and artist Kes Woodward will talk about the value of history paintings and the era responsible for this work. The lecture will also examine Leutze’s life and career, including his most famous painting, a depiction of Gen. George Washington crossing the Delaware River during the American Revolution. The Alaska Purchase—denounced at the time as “Seward’s Folly” but now seen as a masterstroke—is known as a key moment in American history, but few know the whole story. Dr. Lee Farrow, professor of History at Auburn University at Montgomery, will give an overview of just what the Alaska Purchase was, how it came about, and its impact at the time. She will also discuss the implications of the deal for foreign policy and international diplomacy far beyond Russia and the United States at a moment when the global balance of power was in question. This talk is sponsored by the Kennan Institute of the Wilson Center. The exhibition opens to the public with special emphasis on the famous Leutze painting, which depicts the negotiation of the “Alaska Purchase,” as well as the original check and the Treaty of Cession for the purchase, on loan from the National Archives. A caviar and vodka tasting will be featured, along with a live performance by the Russian American Colony Singers. The museum will host a special screening of the 1959 film The Flying Saucer, which begins the coordinating film series that will be simultaneous with the run of the exhibition. Special art programs for children and families related to the exhibition content will be offered during the Anchorage School District’s spring break. To highlight the 150th anniversary of the purchase of Alaska, Triumvirate is producing a commemorative puppet show and radio drama accompanied by graphic novel style art work produced by students all over the district. Illustrations will be projected on our 20 foot screen during the radio drama, and will follow with an explanation of what happened in Alaska after the purchase told with 23 large puppets. A panel of knowledgeable Sitkans, moderated by Eric Jordan, will tell about places and place names (including the names that aren’t on the charts), the stories behind ancient Tlingit names, Russian names and how they got there, and the local vessels and personalities who left their mark in Sitka’s geographic lore. In the second half of the program, audience members will be able to share their own local knowledge of places, names and stories. Architect and historian Wayne Jensen will give a Fireside Lecture on Seward’s Folly 150 Years Later at the Mendenhall Glacier Visitor Center, U.S. Forest Service. Elementary school students will perform a play titled The Transfer of Russian America to the United States; K-12 groups will perform Russian music from the 1860’s; Sitka Studio of Dance will perform ballet from the same era. 360 North public television in Juneau will rebroadcast the discussion of the legacy of U.S. Secretary of State William H. Seward who negotiated the Alaska Treaty of Cession with Russia in 1867. John Pugh, former University of Alaska Southeast chancellor moderates the discussion by Jonathon Ross, Terrence Cole, and Wayne Jensen (members Alaska Historical Commission), Steve Haycox (Distinguished Professor Emeritus, UAA), and Ross Coen (Editor, Alaska History). Tune in at 9:00 pm AKST. The Alaska Sesquicentennial Commemorative Exhibit will highlight and showcase Alaska Native perspectives on the sale and its long-term impacts today. Many of the artists will be present for this opening reception, but the art will be on display throughout the summer of 2017. The exhibit will also be highlighted on the park’s website and through social media. Held at Sheet’ka Kwaan Naa Kahidi, this event will honor and celebrate the Tlingit community. It will feature Clan leaders, culture bearers, dance performances, and storytelling. This luncheon will be held at the National Press Club on the 150th anniversary of the day both parties agreed to the Alaska Treaty of Cession. State Senator Gary Stevens will be giving a lecture on the sale of Alaska and the treaty at the Baranov Museum, at 7:00pm on the 150th anniversary of the signing of the Treaty of Cession. Sesquicentennial Perspectives: Two Historical Views of the Alaska Purchase, a lecture by William Iggiagruk Hensley, Professor of Business and Public Policy at the University of Alaska Anchorage. The lecture will be held at Mountain View Branch Library, preceded by a reception. 6 pm. The Bureau of Land Management Booth will have information about the Treaty of Cession. The annual Museum Walk features the artifact of the month at the Sheldon Jackson Museum; a 150th commemorative exhibit on Alaska Native art at the Sitka National Park; an open house at the Russian Bishop House; hands-on activities at the Sitka Maritime Heritage Center; the presentation of a new major icon shrine at the Russian Orthodox Cathedral; and live music from the 1860’s and refreshments at the Sitka History Museum. The Anchorage Museum will host David Ramseur, a Visiting Scholar in Public Policy at the Institute of Social and Economic Research at the University of Alaska Anchorage, who will give a presentation on the melting of the “Ice Curtain” between Alaska and the Russian Far East in the 1980s and 90s. As Alaskans mark 150 years since the US purchase of Russian-America, a fascinating part of that history is Alaska’s relationship with its Bering Strait neighbor. After 40 years of a Cold War “Ice Curtain,” Alaskan and Russian citizen diplomats opened the border and launched a 30-year era of perilous yet prolific progress. Longtime Alaskan and Russian expert David Ramseur has documented this era with a new book, Melting the Ice Curtain, a story of how inspiration, courage, and persistence by citizen diplomats can bridge a widening gap in superpower relations. Ramseur will recap that era and how its lessons are vital for US-Russian relations today. This performance seeks to promote understanding and bring cultures together through music, storytelling, and dance. Featuring the world famous Moscow Nights Trio, Russian American Colony Singers, New Archangel Dancers, and local Alaska Native dance groups. A lecture series that explores a variety of historical topics and perspective related to the history of Alaska. The Anchorage Symphony, Anchorage Concert Chorus, and Alaska Chamber Singers present excerpts from the quintessential Russian opera Boris Godunov by Mussorgsky to commemorate the 150th anniversary of the United States’ purchase of Alaska from Russia. This masterpiece has been touted as a revolutionary folk drama set in the art of opera that amazes with its boldness, breadth, and dramatic fireworks. Conducted by Randall Craig Fleischer. Atwood Concert Hall at Alaska Performing Arts Center. A concert celebrating folks traditions, featuring the Moscow Nights Trio and the Russian American Colony Singers. With a welcome dance from the Sheet’ka Kwaan Naa Kahidi Dancers, and additional performances by New Archangel Dancers and the St. Michael’s Cathedral Choir, this event will promote understanding and bring cultures together through music, storytelling and dance. Presented by Ana Ditmar, Sitka National Historical Park, 7 to 8pm. David Ramseur will speak as part of the History Chats series at Chugiak High School. Program sponsored by Tundra Vision Public History Consultants. This unique program commemorates Alaska’s Sesquicentennial and celebrates the multicultural nature of Alaska through the ‘universal language’ of music. The program incorporates Russian folk songs, Alaska Indigenous storytelling, and special appearances by world renowned Russian trio “Moscow Nights.” It promises to touch each heart as we focus on values so vital to Alaska: respect for the diversity of its people, deep appreciation for their interwoven histories, and a shared love of this great land. Presented by Dave McMahan, Harrigan Centennial Hall, 7 to 8pm. April 21 Leon Aron will be the featured lecturer. The Anchorage Museum will host Leon Aron, a resident scholar and the director of Russian studies at the American Enterprise Institute (AEI). Dr. Aron will speak on Russian domestic and foreign policy; US-Russia relations; and the economic, social, and cultural aspects of Russia’s post-Soviet evolution. Hosted by a volunteer committee in partnership with the Pratt Museum and Kenai Peninsula College, the conference will be held at the Kenai River Campus of Kenai Peninsula College in Soldotna. The conference will include a symposium for the general public about the Kenai Peninsula, the Cession, and the area’s unique blend of Native, Russian, and US traditions, with related cultural and educational activities for all. Interested parties can look at our website, our Facebook page, or contact Shana Loshbaugh here. REGISTRATION NOW OPEN. The event is co-hosted by the University of Alaska’s Museum of the North. Sitka has more saints than any other city in the United States. Presented by Father Michael Oleska, Harrigan Centennial Hall, 7 to 8pm. What was Juneau like 150 years ago at the time of the purchase? Who lived in this area, and how did the land look compared to today? Explore these questions from 6:30-8:30pm during a free presentation by Richard Carstensen at the Juneau Arts and Culture Center (JACC), sponsored by the Friends of the Juneau-Douglas City Museum. During his presentation, Carstensen will describe the Juneau area, or Aak’w Aani (small lake tribe land), at the time of purchase, its human and natural history, as well as how the land has dramatically changed between that time and today. This project will also produce three exhibit panels that will hang in the Museum entrance starting this summer, so visitors can appreciate and learn about the homelands of the Áak’w Kwáan. Contact Jane Lindsey jane.lindsey@juneau.org for more information. The Alaska Arctic Council Host Committee will be hosting public education opportunities, policy and research activities and many other side events prior to and after the Arctic Council Ministerial, which occurs at the conclusion of the U.S. Chairmanship of the Arctic Council. Held in Whitmore Hall on Sitka Fine Arts Campus. The Quilters will host a celebratory Mother’s Day Tea on May 14th. The Seward statue will be unveiled and the Treaty of Cession will be celebrated through a variety of events at the Seward House Museum. Wayne Jensen is giving a talk at the Lincoln Rotary Club in honor of Seward’s birthday. The event will be held at the Nebraska Club, 233 S. 13th St., 20th Floor. Noon. Presented by Tamie Parker Song, Sitka National Historical Park, 7 to 8pm. Rotary Club of Seward, Nebraska will be hosting this program. Program and unveiling of the Seward statue at the historic Kennard House, Nebraska Statehood Memorial, Nebraska Historical Society site, Lincoln, Nebraska. 11 a.m. The Sitka Historical Society will do a Table Read for our one act play at 7pm at the Pioneer Home Chapel. Presented by Steve Haycox, Sitka National Historical Park, 7pm to 8pm. Presented by Mike Dunham, author of the books The Man who Sold Alaska and The Man who Bought Alaska. Harrigan Centennial Hall, 7 to 8pm. Robert David Hoffman will be giving a Poetry Reading at 7pm, Sitka National Historical Park. 360 North public television in Juneau will rebroadcast the discussion of the legacy of U.S. Secretary of State William H. Seward who negotiated the Alaska Treaty of Cession with Russia in 1867. John Pugh, former University of Alaska Southeast chancellor moderates the discussion by Jonathon Ross, Terrence Cole, and Wayne Jensen (members Alaska Historical Commission), Steve Haycox (Distinguished Professor Emeritus, UAA), and Ross Coen (Editor, Alaska History). Tune in at 8:00 pm AKST. The event will consist of the dedication of Seward statue by sculptors, David and Judith Rubin, and a reception at the Juneau-Douglas City Museum. More information can be obtained from Wayne Jensen, wayne@jensenyorbalott.com. Presented by Chip Lewin, Commanding Officer, USCG Sitka. Harrigan Centennial Hall, 7pm to 8pm. Presented by David Ramseur at Harrigan Centennial Hall, 7 to 8pm. Presented by Rebecca Poulson at Sitka National Historical Park, 7pm to 8pm. The lecture will explore how Sitka Tlingit and “Creole” people, the fur trade, missionaries and soldiers, “hootch,” and stereotypes set the stage for Alaska as we know it today. The event will be held at Sitka National Historical Park. Margret Grover and Dan Thompson will present, Harrigan Centennial Hall, 7 to 8pm. Chris Allan will present, Harrigan Centennial Hall, 7 to 8pm. Kolmakov in Dillingham this past July; and comment on the future of Russian-American relations. Wayne Jensen will present on the history of Seward’s early life, his service as Lincoln’s Secretary of State, the negotiation of the Treaty of Cession, and his visit to Alaska in 1869. Harrigan Centennial Hall, 7 to 8pm. Presented by Harvey Brandt. Sitka National Historical Park, 7pm to 8pm. Presented by Anne Pollnow. Sitka National Historical Park, 7pm to 8pm. Video conference featuring Wayne Jensen (Architect, Juneau), Terrence Cole (Historian, UAF), Stephen Haycox (Historian, UAA), Aaron Leggett (Curator, Anchorage Museum), and Ross Coen (Historian and doctoral candidate, University of Washington) discussing issues surrounding the commemoration and celebration of the Alaska Sesquicentennial. Noel Wien Library, 6:30-8:00pm. Sponsored by the Alaska Library Network and the OWL Program (Online With Libraries) with funding from the Alaska Historical Commission. The Sheldon Jackson Museum is hosting a reception for the return of a Chilkat robe that Seward bought/got while he was in Alaska in 1869. Native dancers will welcome the robe home; the event will include Clan leaders from Angoon, Hoonah, and Sitka. Refreshments will be served and all are welcome. 7pm, Harrigan Centennial Hall. Artist Shelly Laws will give a lecture on Chilkat weaving and the returned robe. Refreshments will be served, all are welcome. 6:30pm, Sheldon Jackson Museum. The USRRC is sanctioned by the Sports Car Club of America, the Road Rally which has a team of Driver and Navigator, travels on public roads in search of checkpoints. The Centennial in 1967, held a Road Rally from Anchorage to Fairbanks. The event is for Cheechako (those new to sport) to Sourdoughs (experienced) rallyists. Road Rallying has been active in Alaska since before Statehood in 1958! Come join us! 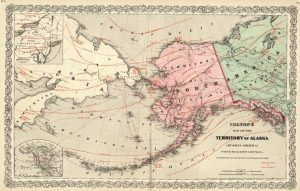 On March 30, 1867, Russia and the United States signed the Treaty of Cession agreeing to the sale of the Alaskan Territory. The United States gave the government of Russia a check for $7.2 million and took possession of 586,412 square miles of land, which became the Alaska Territory, and later, in 1959, would become America’s 49th state. Join the Smithsonian Associates and the Alaska State Society to hear fascinating stories about the Alaska Purchase from experts during this entertaining and informative all-day program. 10am-3pm, S. Dillon Ripley Center. 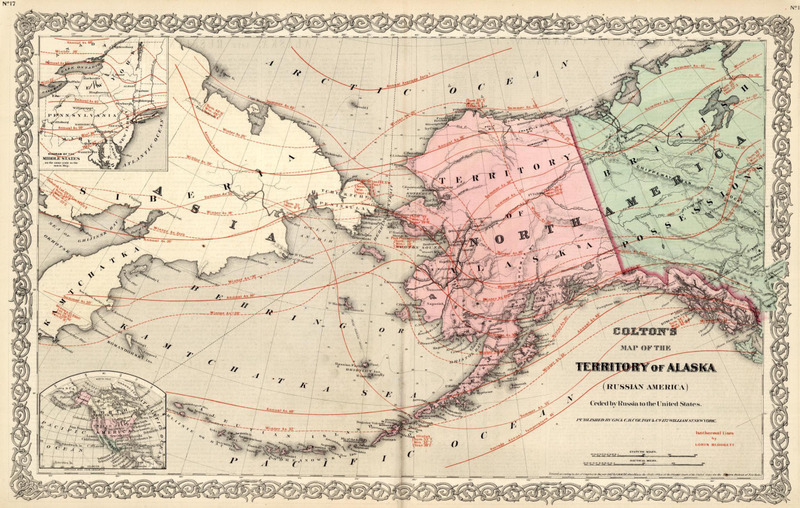 On March 30, 1867, Russia and the United States signed the Treaty of Cession agreeing to sale of the Alaskan Territory. To commemorate the life and contributions of William Henry Seward the State of Alaska is sponsoring a performance of Wild Shore New Music. You are invited to join as Wild Shore New Music performs the work of living composers who have found inspiration through their experiences with the natural beauty and indigenous cultures of Alaska. Kenai Fine Arts Center. 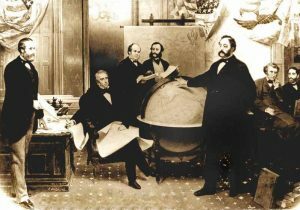 On March 30, 1867, Russia and the United States signed the Treaty of Cession agreeing to sale of the Alaskan Territory. To commemorate the life and contributions of William Henry Seward the State of Alaska is sponsoring a performance of Wild Shore New Music. You are invited to join as Wild Shore New Music performs the work of living composers who have found inspiration through their experiences with the natural beauty and indigenous cultures of Alaska.Bunnell Street Arts Center. This year the Anchorage Museum is hosting the joint Alaska Historical Society/Museums Alaska annual conference. The 2017 theme—Exploring the Legacy of the Alaska Purchase—invites reflections on how that moment charted a new destiny for Alaska. In particular the theme opens the door for indigenous perspectives on the meaning of this pivotal event. Please join us as we examine how Alaska’s history unfolded, is unfolding and may yet unfold since that day in 1867 when Czar Alexander II abandoned North America. Our featured speaker will be Professor Willie Hensley, author of Fifty Miles from Tomorrow and an Alaskan who shaped the state we live in today. On March 30, 1867, Russia and the United States signed the Treaty of Cession agreeing to sale of the Alaskan Territory. To commemorate the life and contributions of William Henry Seward the State of Alaska is sponsoring a performance of Wild Shore New Music. You are invited to join as Wild Shore New Music performs the work of living composers who have found inspiration through their experiences with the natural beauty and indigenous cultures of Alaska. Sponsored by the Atwood Foundation. Anchorage Museum, 1:00 pm. Presented by Jenya Anichenko. Harrigan Centennial Hall, 7pm to 8pm. The Lieutenant Governor’s Office will host an exhibit on October 6th from 4:30 – 7:00 on the 3rd floor of the Alaska State Capitol Building. Come learn about the history of the Seward Shame Poll erected at the Taant’a Kwaan village following Secretary of State William Seward’s 1869 visit, and newly reproduced in Saxman by Stephen Jackson. The State of Alaska Division of Libraries, Archives, and Museums presents an exhibit commemorating the transfer of Alaska’s transfer from Russia to the United Sates. The exhibit will feature significant maps, photographs, documents, and objects related to the 1867 transfer, most of which will be exhibited for the first time. Objects will include rare paper documents related to the 1867 transfer which have undergone conservation treatment and repair by a professional conservator; the nineteenth-century painting Signing of the Treaty of Alaska by Emanuel Leutze; an eight foot map of Sitka, drawn in 1867 for the transfer; and documents penned by Chief Administrator of the Russian America Company, Prince Dmitry Petrovich Maksutov. This exhibition, held at the International Gallery of Contemporary Art, is centered on the perceptions and interpretations of artists, historians, writers, and performers responding to the Alaska Treaty of Cession. It is a contemporary response based on images, words, and actions; audible through spoken and unspoken communication. This year, Commonwealth North celebrates 150 years of Alaska under the American flag with a series of events and publications showing not only that the purchase was “worth it” but also showing a vision of further contributions the people of this state can make to U.S. and global economics, security, knowledge and culture.CWN Board Members and Study Chairs, Meera Kohler and Joe Mathis, invite you to an all-day symposium to examine seven frontiers Alaskans have worked to advance since the Alaska Purchase and continue to advance today. Attending this symposium makes you a part of this unique study group and a coauthor of an enduring publication – a testimonial to the “pioneering” Alaskans have done – and have yet to do! The event will be held from 9:00 am to 2:00 pm at the Anchorage Museum. Anyone interested in the indigenous peoples of Southeast Alaska is welcome to attend this unique biennial event, a multi-disciplinary three- to four-day conference that includes Alaska Native tradition bearers, elders, and fluent speakers of indigenous languages meeting with artists, academics, students and other learners. Our conference will add new perspectives, that of Alaska Natives, whose challenges to the so-called “Purchase of Alaska” were finally addressed in the Alaska Native Claims Settlement Act of 1971. Join Sitka elders who will point out Tlingit place names, describe subsistence and cultural practices, and provide personal memories of places and features in the waterways near Sitka. Everyone is advised to bring their own food and soft drinks. The cost is $75 or $55 for students (with ID) and elders (65+). At 12:30 pm, board the Allen Marine vessel at Crescent Harbor, the tour loading dock (just east of Harrigan Centennial Hall); the tour is from 1:00-4:00 pm. The Friends of Sheldon Jackson Museum will host a reception at the museum in honor of Alaska Day. Refreshments and cookies will be served. 1:00 pm to 3:00 pm. This original one-act play written by Zachary Desmond and directed by Taylor Ciambra and will be performed to commemorate 150 years of Native, Russian, and American heritage as part of the 150th Commemoration of the Transfer of Alaska from Russia to the United States. The play centers on the citizens of our town in 1870 and how they are navigating the issues caused by the changes in land ownership, racial discrimination and of course, love. There will be two performances 5pm and 7pm at the Sheet’ka Kwaan Naa Kahidi Community House. Brought to you by the Sitka Historical Society. The Alaska State Library Historical Collections takes a look back at 1967 with a free showing of five historic short films about the Purchase of Alaska. The screening will include two films featuring banker, politician and philanthropist Elmer Rasmuson, who recounts the events that led up to the signing of the Treaty of Cession and the events that occurred on the first Alaska Day in 1867; an animated short film that tells a humorous version of how Alaska became a Russian Colony; a U.S. Army film that examines the history of Alaska and looks at the state’s contributions in terms of strategic defense location and resources; and an ATV news special that reports on how Alaskans were celebrating the 100th anniversary of the event. 2:00 pm, Andrew P. Kashevaroff Library Lecture Hall. Tim Troll will give a lecture at the Sheldon Jackson Museum at 5:00 pm. With a Memorial Service at the National Cemetery, tea at the Pioneer Home, and more. Alaska Day in Alaska: See how Alaskans have treated this holiday with newspapers from this day over the years and around the state. In addition to images, we’ll have some newspapers Cued up on Our microfilm readers, so you can explore beyond Alaska Day, digging a little deeper into what the state was like. Survivance: An exhibit of photographs and documents from Alaska State Library’s historical collections depicting Alaska Native life under colonialism, with an interactive opportunity. Join us for the first of periodical special research days at the Reading Room and Research Center. You’ve asked for an opportunity to use the unique collections on the 2nd floor of the APK outside of standard work hours. To try to meet this need, we’ll occasionally open up on a holiday, Saturday, or evening. To best take advantage of this opportunity, consider calling ahead to make sure we have the materials you need available. State Library Reading Room (Alaska newspapers on microfilm, legal resources, maps, material to check out, and more): 907-465-2920; Historical Collections (Alaskana, including circumpolar materials: unique manuscript and photo collections, rare books, special formats): 907-465-2925; State Archives (Alaskan government records, including state and territorial): 907-465-2270. The Cook Inlet Historical Society is hosting a panel discussion at the Anchorage Museum addressing the causes and consequences of the Treaty of Cession. Historian Steve Haycox will moderate a panel that includes Andrei Grinev from St. Petersburg, Ilya Vinkovestsky from Vancouver, Andrei Znamenski from the University of Memphis, Joaqlin Estus, Tlingit archivist and historian, and Andrey Khalkachan from Siberia. Sitka Historical Society Annual Meeting will feature Jana Suchy speaking about her photography journey. Free admission. 6:30 pm, Centennial Hall. This exhibit will be held at the Sheldon Museum. The 2017 Jewish Gala will be an event celebrating the high ethical business standards implemented by the original Jewish foundations of the ACC, promoting and modeling diversity and tolerance for Alaskans to emulate, as well as their historic contribution to the purchase of Alaska. For more information contact gala@alaskajewishcampus.org.